French names are a great place to start when seeking an identity for your French Bulldog. Sophi, Brie, and Noir are a small sample of French name ideas to get you started. One of the suggestions we make to new puppy owners is to evaluate their dog’s appearance prior to making a naming decision. 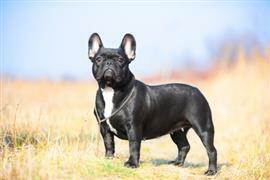 French Bulldog owners are bound to note the defining bat-like ears common among the breed. Choosing a theme related to any notable characteristics can lead to some fun and fitting names. For example, as a result of the breed’s distinct ears, a Gremlins theme might be appropriate. Brain, Daffy, Lenny, Greta, and Stripe are names borrowed from memorable creatures in the Gremlins movies. Just remember not to feed them after dark! While a physique inspired theme is a good way to go, you really don’t need a reason to choose a particular theme. A currencies theme provides a unique set of name options. Penny, Dinero, Lira, and Rupee are a few ideas obtained by this approach. Other ideas such as Ford, Bentley, Lexus, Chevy, and Porsche can be borrowed from well-known automobile manufacturers. Some of our pages will contain a subcategory. A subcategory is a slightly more specific grouping than the main topic of the page. For a subcategory, we will include a separated table of names and corresponding descriptions. An example of a subcategory of Red Dog Names would be 'Dog Names Inspired by Red Wines'. If you have any subcategory ideas for the French Bulldog Names page, we would love to hear them. Use the form below to submit your ideas.